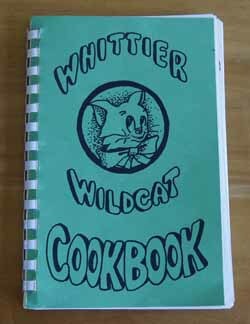 Cookbook #121: Whittier Wildcat Cookbook, Whittier School Community, 19??. 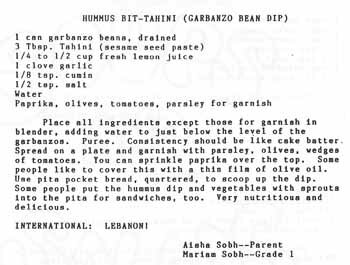 “I have no idea where this book came from” reads my cookbook database. Nowhere in this book is a publication date. 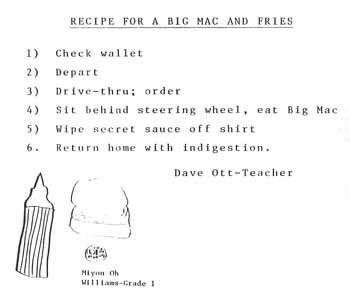 It is a “community cookbook” – compiled by the teachers, parents and students at an elementary school. 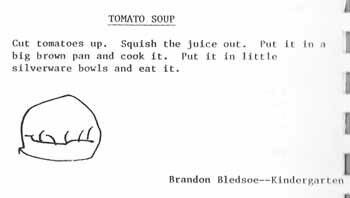 (Here is the first community cookbook covered in this blog.) 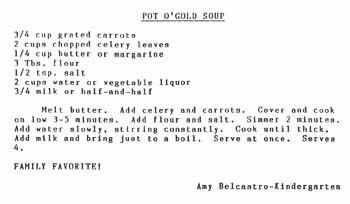 The introductory page thanks “Mary West-Smith” for typing all of the recipes on her word processor, so my guess is that it was produced in the mid-1970s. “Whittier” at first calls to mind the city in Southern California. But no . . . “Whittier” is also an elementary school in Boulder, Colorado. A school on Pine and 20th. Well, this all is starting to make sense. We lived in a dumpy old house on Walnut, full of character (and characters), for a couple years in the mid-1970s. We called the house “Walnetto”. What times. The Whittier school was just a couple blocks from Walnetto. 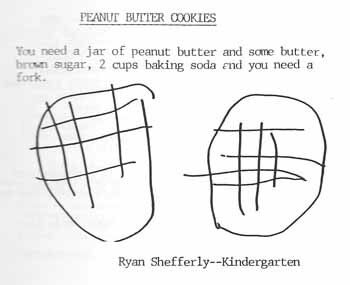 Perhaps a child or parent was going door-to-door with this cookbook and I bought it from them? Quite likely. And yes I googled this book. I found a couple references that confirm it was published in Boulder, Colorado – and the publication date is unknown. I could purchase it through AbeBooks.com for $22.90 (!). And special treats! Little kids contributed some of the drawings and recipes. Below is a combined version of the Whittier Wildcats recipes, with a couple small modifications of my own. 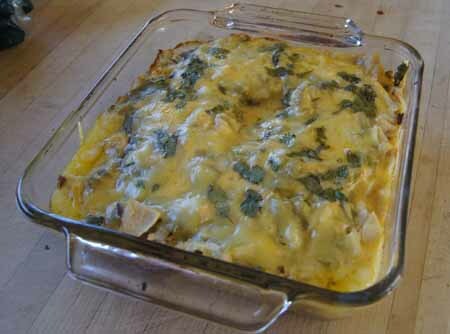 Note: This casserole is a good way to use up leftover cooked chicken, but if you don’t have any around, cook one large boneless chicken breast for this recipe. Mix the cream of chicken soup with the chicken broth. 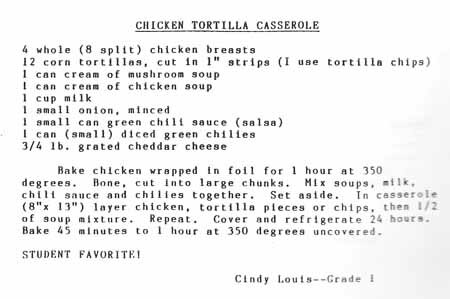 On top of the tortillas, add half of the remaining chicken, half of the onion, half of the soup-broth mixture, half of the green chiles, half of the green chile salsa, half of the cheese, and a sprinkling of cumin. 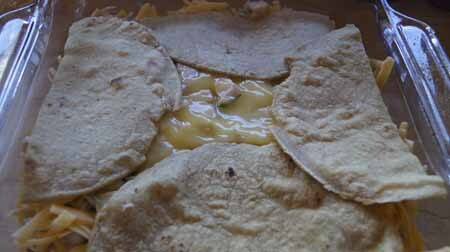 Add another layer of tortillas, then top with the remaining ingredients. Put a little cilantro on top for flavor and color (if you like cilantro). Bake at 375˚ for 35-45 minutes, until the whole top is bubbly (check the center). This was a huge success. The garlic, cumin and cilantro perked up the original recipe(s) but did not overwhelm the dish. I baked for 30 minutes, but it wasn’t hot in the center yet, so I modified cooking time to 45 minutes. 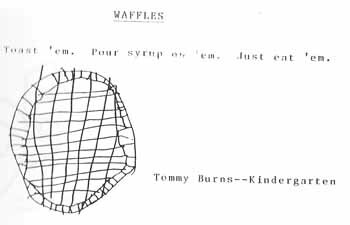 Now it’s time to look at my own version of this recipe. 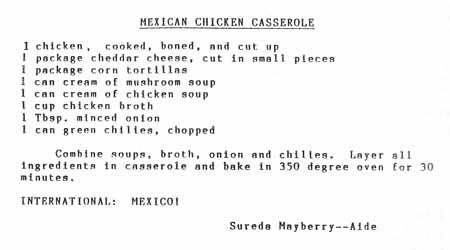 Turns out I have two: one pretty much like the Whittier versions, except it adds chopped green pepper and a can of “Rotel” tomatoes with chiles; one calls for the addition of garlic, cumin, chile powder, and canned red enchilada sauce. Which recipe do we like best? I think this new version without any red sauce at all! 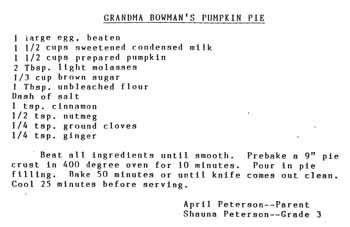 This entry was posted in 250 Cookbooks, Main Dishes, Muffins by admin. Bookmark the permalink.